If you missed Part 1, you might want to go back and check it before continuing. When we left our brave testers, they were standing out in on a range in Fort Knox in winter (Anyone who's done this knows there are nicer places to be), conducting tests of the M4 with the 17pr gun. With two tests covered, we continue down the list of criteria that the Army Ground Forces Board #2 decided to rate the configuration on. There were no reported instances of the phenomenon in the 76mm gun, and the 90mm would produce a “large breech flame” in about 60% of rounds fired. Interestingly, the report notes that when firing HVAP with a muzzle brake, there is insufficient recoil on the 90mm to operate the breech, so by the time the loader gets the breech block opened, any flame would have dissipated. This is simple. Once the gun fires, how much obscuration is created? This test was conducted over a two-day period, the ground was wet both days. 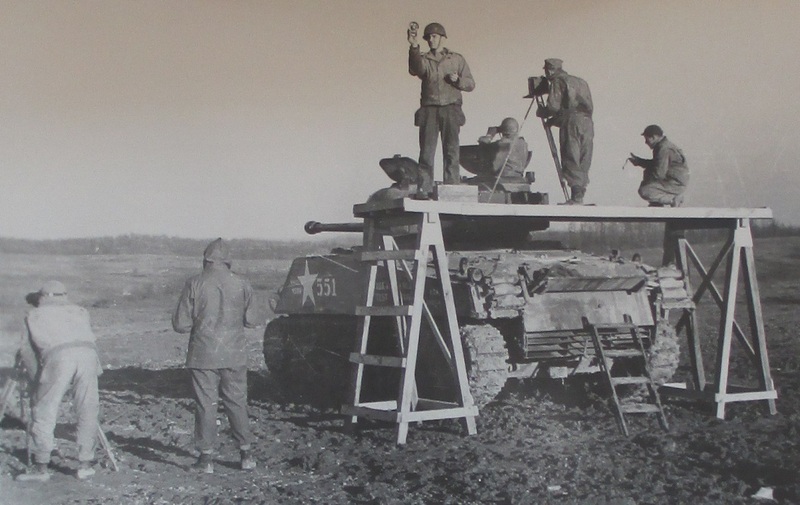 The bore was measured as 7 feet above the ground (the tank was fired at a forward slope). To conduct the test, a 24” black cross was painted in the centre of a 6x6 panel at 1,000 yards. The gunner, with his x3 sight, and the TC with 7x50 binoculars were given stopwatches. Once the gun was fired, they’d start the stopwatches, and attempt to sense the tracer (For the tracer test). They would stop the stopwatch once they could see the black cross without distortion. Gunner: APCBC 3.5 seconds; HE (Reduced charge) 3.7 seconds. There were additional remarks, though, as those don’t tell the entire story. HE Ammunition: Obscuration produced by this round, although of considerable duration, is not sufficient to obscure the target area and therefore prevent sensing of the burst. There is very little flash and smoke is of a lighter texture than that produced by APCBC. TC: APC 2.2 seconds; HE 1.2 seconds. Gunner: APC: 3.0 seconds, HE 2.6 seconds. However, the report notes that the results for HE are misleading, as there are several factors in favour of the reduced charge HE round: The slower time of flight (1,800 fps vs 2,700), the addition of a tracer on the British round, and the much less intense obscuration caused by having only about half the propellant. The 76mm results for APC were "neglibile" for the TC and 0.8 seconds for the gunner. No records were found for HE firing, interestingly. Purpose was “to determine the blast pattern for the 17-pounder firing APCBC”. It was deemed that there was little purpose in determining the pattern for the reduced charge HE (No full-charge was available) given there was little observed blast from the small propelling charge. The setup for the blast, tracer and obscuration tests. Note the blast meters in the ground. The comparative data for the Tank Destroyer Board came from testing of the towed cannon. So although more blast meters were broken by the 90mm than the 17pr, it was pointed out that the cannon was also closer to the ground, which may counter it a bit. No official metering was found for the 76mm, but the troops on site gave personal opinion that the 76mm was less than either of the other two guns. The obscuration, blast and tracer tests were all conducted at the same time. On the far left is an observer equipped with a x20 observation device. The TC was using his binoculars and the gunner, of course, his x3 sight. Tracer action in the HE round (reduced charge) was found to be satisfactory, with only infrequent occurrence (Less than 20%) where obscuration was so severe that tracer could not be observed by the crew. APCBC was a bit more complicated. “The tracer element was observed to separate from the core on numerous occasions, and often dropped off on the ground at ranges from 200-600 yards. “ It was theorized that there was some relationship to the sabot separation. Test 7: Adjustment of Fire. “Adjustment problems (Limit, five rounds per target) were fired with APCBC and HE ammunition on panels set up at unmeasured ranges varying from approximately 700 to 2,000 yards. The method proscribed in the 17pounder handbook for direct fire up to 2,500 yards was used.” There was no method listed in the manual for adjusting HE. “APCBC: Obscuration was so great and the time of flight so short that neither the tank commander nor the gunner was able to sense strikes except at ranges in the vicinity of 2,000 yards. With the aid of a flank observer located about 25 yards from the tank, adjustment could be made on the shorter range targets, but only at the sacrifice of time." HE: A total of seven panels were engaged, five were hit. "APC: 76mm APC because of short obscuration time and good tracer is easier to adjust than either 90mm or 17-pounder. Obscuration provided by 17-pounder is greater than that produced by 90mm. HVAP: No special difficulty was noted in adjusting 76mm or 90mm HVAP. HE: The 17 pounder HE (reduced charge) round is the easiest of all to adjust. With the full charge (2950fps) ammunition which was not available for test, indications are that the obscuration expected will make ease of adjustment comparable to that of the 17 pounder APCBC which was extremely difficult.” The 90mm was given the edge on adjustment to the larger burst provided by the larger HE content. The 76mm and 90mm guns were making 75% hits in comparable tests. The 76mm had the advantage in rate of fire and low obscuration, allowing the TC to make good use of correction, while the 90mm had a higher muzzle velocity requiring less lead and making tracking easier. Most of the rest of the tests are actually pretty short and simple, so we'll blow through them in part 3. For the forum discussion thread, you know what to do.